Schmidt Hammer Lassen Architects is an international practice founded in Denmark in 1986. From the offices in Denmark and China, pro-jects of cultural and educa-tional buildings, offices, commercial, retail and resi-dential, often in mixed-use developments and complex urban contexts, are corner-stones of our output. With 15 offices and more than 450 employees in Nor-way, Sweden and Denmark LINK arkitektur is one of the leading architectural firms in Scandinavia. With an exper-tise in making complex ar-chitecture, client advising, economy we connect all participants in creating the most inspiring spaces across borders, sectors and people. 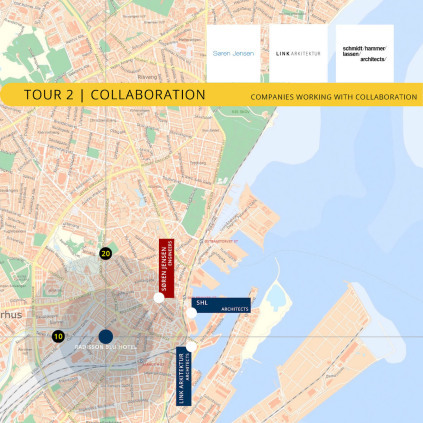 Søren Jensen is a family-owned Danish engineering firm with over 150 staff in 4 offices. It was founded by Søren Jensen in 1945 and is currently run by the third generation of the Jensen family, Frank Jensen, in Aarhus. The company has always upheld the belief that engineering should not be just about solving technical challenges but also about how we can use our knowledge to create a total building solution where engineering and architecture are integrated. Our focus is on creating value, not just financial, but also the value that is created when great architecture and engineering come together.